Now, as all us parents know, when our children come home all excited about something they have just learned, they want to share it with us! This is pretty much where my journey into the world of Seido Karate began, standing in my kitchen in a strange stance, legs burning, throwing punches at my son who responds with a barrage of defensive moves . I am sure anyone looking in from outside would have called Child, Youth and Family Services and reported us, but the only one with bruises afterwards was me! “Dad, you should come along and watch, you might like it, and you don’t have to join in if you don’t want too”. I must say at this point I was a Dad who had little to no interest in karate, this was something my son wanted to pursue but I really wanted him to apply himself more to his Rugby. My lack of interest along with my large workload meant I was not giving Liam and his new passion the attention they deserved. This was all about to change with Liam’s first grading coming up. I went along to a couple of his classes and distinctly remember feeling very uncomfortable the first time I entered the Dojo. I sat close to the door so I could escape should they try to drag me up and promptly pulled out my phone to try and look busy. I did my best to just fade into the background but little escapes the eye of Sensei Ken who quickly noticed the new face and headed over to introduce himself, shaking my hand and slightly bowing as he did so. Sitting next to me he told me about Liam’s progress in his first 4 months of karate. He commented on Liam’s strengths and how he saw him as a great kid with loads of potential. He welcomed me into his Dojo and into the extended Seido family with open arms and a warmth that really captured me. I could feel the strength of this guy just from sitting next to him, and throughout the class watched as he taught my child how to push himself to be a better person. The class ended with the children being reminded to always show love and respect to their parents and those around them and to try hard in everything they do. I was literally blown away with what I had just seen. After going back to watch a few more of Liam’s classes it was time for Liam’s first grading. It was a Friday night and the kids were all excited about what was about to transpire, Liam looked worried but ready. Earlier in the week Sensei Ken had pushed the grading group pretty hard in class to give them a taste of what to expect and, without going into detail, Liam came away doubting he could do it. The grading got under way and I watched as the children pushed as hard as they could to show what they knew. Liam dug really deep and I must say that until this point I had never seen him display so much determination and drive, I was truly inspired. I went away from Liam’s grading and reflected on what I had just seen. I looked back to the first day I stepped into Sensei Ken’s Dojo, remembered the feeling of strength that emanated from him. I thought about the respect his students have for him and the respect he shows them in return. I thought about the elation I had seen on my sons face, the massive sense of achievement he was feeling and the camaraderie he had built up with others, children and adults alike, in the Dojo. I wanted to be a part of this. A couple of weeks later I found myself standing on the Dojo floor in that same “zem-coochie-dancie” stance, looking like a geriatric hurdle jumper trying to keep up with the other students. I had no idea what this crazy little Chinese guy was yelling at us, all I could pick up was that we were all terrible and too slow, that our OSU wasn’t loud enough and that the word is Kiai not Hi-yah, Eeee-yah or a loud grunt! I was sweating profusely and my tracksuit pants were about to cause me an injury but boy was I having some fun! I would be a liar if I said I was not nervous about joining in, and it took me a number of weeks to zone out to the people watching from the bench. For some of us the first step is so hard to take, some of us are really self-conscious, some of us doubt our fitness, and some of us are just plain scared to take that leap into the unknown. These are the exact things that makes every day I train in karate so special to me. I was self-conscious, worried about my fitness level and scared in my first class too but I challenged myself to take the leap and have not regretted it. Since joining Sensei Ken’s Seido Karate Dojo, my wife Wendy has also joined. Wendy, Liam and I are a family that plays together and I firmly believe that we are a family that will go all the way together. 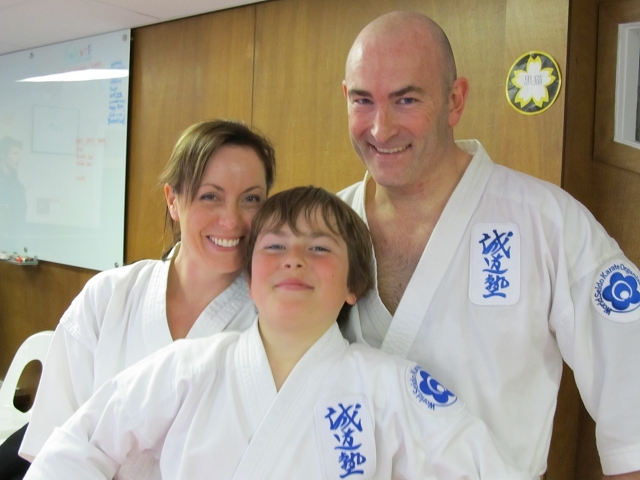 We are also a part of a bigger family, the Lower Hutt Seido Karate family who have welcomed us with open arms. We are a family that decided to join the game and not just watch from the bench, why don’t you come and join our family too?